Here comes number 3 from the sportive german based label. This time by Mark Minin, aka Impact, a young promising producer from the holy land israel. Two beautiful tracks for the morning hours will lift you up into the next dimension of dreaming while you dance. 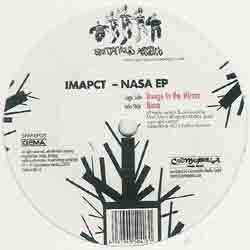 'Nasa' come along with a pumping offbeat and stable synths, on top a wonderful stringchord which will give you the right summer feeling. 'Image in the mirror' is more pumpy and come along with a hige shuffeled bassline which reminds on the good old days - already a real classic... don't miss this stunning debut from Spontaneous Aerobics.